We celebrate the strong leadership provided by women who are members of our governing Council: Rev. 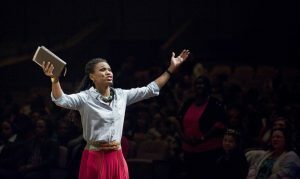 Carolyn Moore (Vice Chair, and Church Planter and Lead Pastor of Mosaic Church), Rev. Madeline Carrasco-Henners (Secretary and Associate Pastor of LaGrange First United Methodist Church), Cara Nicklas (attorney and chair of our Governance Committee), Jennifer Cowart (Executive Pastor, Harvest Church), Rev. Jessica LaGrone (Dean of Chapel, Asbury Theological Seminary) and Michelle DeRouen (financial advisor). In a lecture delivered at Asbury Theological Seminary in 2007, Richter developed her analysis of the relevant biblical passages related to this issue. We agree that it is the Holy Spirit who decides who receives which spiritual gifts. Furthermore, the Bible teaches us that it is the function of the body of Christ to honor the gifting bestowed, and to support and facilitate the use of such spiritual gifts by biblically qualified individuals in the mission of the church without regard to gender. The Wesleyan Covenant Association is fully committed to and celebrates women serving as leaders, preachers and teachers in life of the church and beyond. Keith Boyette is an elder in the Virginia Annual Conference of The United Methodist Church and the President of the Wesleyan Covenant Association.